Almost any climb that will pique the interest of a modern alpinist will require two ice tools. The choice of tools will depend on how technical the route is – for a route that is expected to be mostly snow and low-angle ice a relatively straight tool will be fine, but for steep ice and mixed terrain an aggressive, waterfall-oriented tool will be best. A radical bend in the upper shaft is generally preferable to a radical bend in the lower shaft, because it increases the tool’s performance over ice bulges and while drytooling without significantly affecting the tool’s plunging ability. Be aware that tools with aluminum heads will make your hands colder while plunging in really low temperatures because aluminum is a better conductor of heat than steel. A tool for steep terrain should have a pinky fang for holding onto it without leashes, and ideally also an upper hold for matching on the shaft. The spike of the tool should have a hole for clipping an umbilical leash. These features obviously hinder the tool’s ability to plunge in snow, but for most routes this is not a problem. The rare instances when good plunging is important are the same as when pickets might be useful: very corniced ridges, rime mushrooms, etc. For versatility it is best to bring one tool with a hammer and one with an adze, or at least one adze among the team. Although at first a skeptic, I have come to believe that wrist leashes truly are a thing of the past and should not be used. This has nothing to do with style, but rather I think it is easier and more efficient to climb without wrist leashes. It is easier to shake out your forearms, faster to place protection, and often requires fewer tool placements. Dropping a tool is not an option on big routes, however, so it is best to use umbilical cords attached to your tools. In fact, you are much less likely to drop a tool using umbilicals than using wrist leashes. Umbilical cords are ideally elasticized so that they don’t hang so low and catch on gear, and should be made of material that won’t ice up really bad. Avoid any systems that require girth hitching your belay loop or tying knots to your tools. It is best for the umbilicals to attach to your belay loop using a biner so that you can quickly unclip them from your belay loop and clip them into the anchor at belays. It is best for the umbilicals to attach to your tools using mini biners so that you can quickly switch between having them clipped to the spike or the head of the tool (clip them to the head of the tool for low-angle terrain). Attaching a swivel to the harness-end of your umbilicals is a big help for reducing tangle when repeatedly switching tools from hand to hand. The most appropriate swivels, which are strong and light, can be found at commercial fishing supply stores. Ice tools with umbilicals – Mark Westman on the Denali Diamond. Photo by Colin Haley. Aluminum crampons are a great choice for alpine rock climbing and easy mountaineering, but for big alpine climbs you will need steel crampons. Avoid crampons with cookie-cutter frames – they work fine for waterfall climbing, but will be very prone to snow-balling while alpine climbing. Anti-balling plates are often a very important piece of safety equipment. You might consider leaving them behind when you are sure it will be far too cold for snow-balling conditions (such as the Alaska Range in winter), but most of the time they are worth their weight. 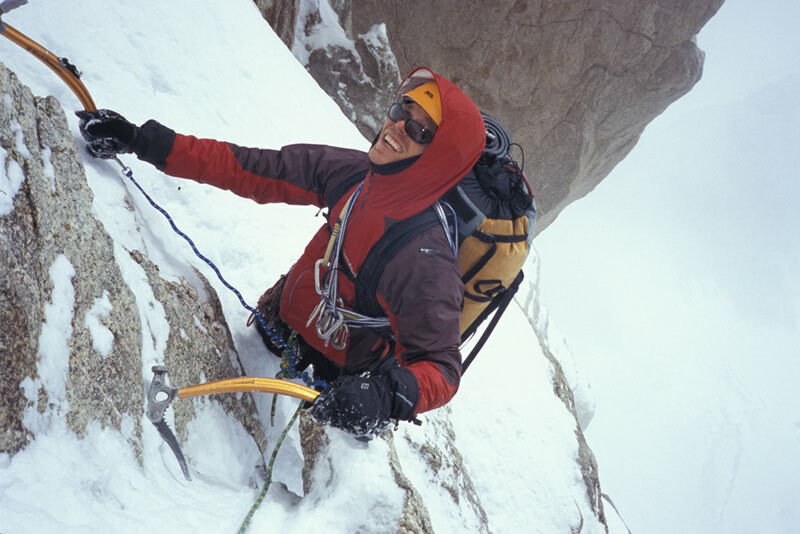 Contrary to popular myth, both horizontal and vertical frontpoints work well for alpine climbing. Horizontal points will give slightly better purchase in snow and neve, but vertical frontpoints will be more efficient on the old, brittle ice one often encounters. Most crampons have multiple holes to adjust the location of the front bails – set your frontpoints to stick out further on routes that are largely snow and ice, and set them further back for routes that involve a lot of drytooling or hard, brittle ice. Some climbers swear that newmatic bindings are the most reliable, but I feel that fully step-in bindings, when well adjusted, have the least slop of any crampon bindings.